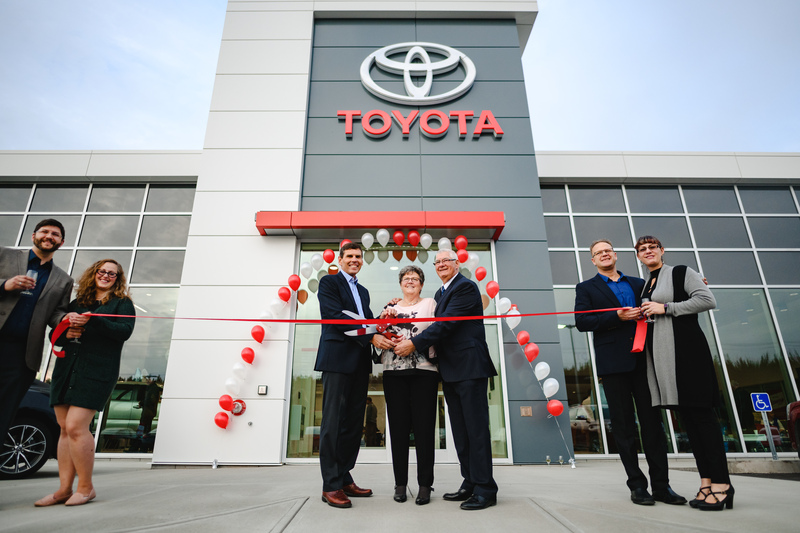 WHITEHORSE, YT, September 26, 2018 – As Whitehorse Toyota eyes a half-century of serving drivers, Toyota’s northernmost dealer is cutting the ribbon on a new showroom and service area designed to warm the heart of every Yukoner. Whitehorse Toyota is well known in the Yukon for its community involvement. The dealership is a long-time sponsor of the annual Yukon Sourdough Rendezvous Festival. (In fact, Mason and his wife Sandra were crowned Mr. & Mrs. Yukon at the 2017 festival!) Ken is also a regular visitor at McCauley Lodge, where he has been playing guitar and singing to entertain the residents of this retirement community for more than 30 years, and the dealership is an ongoing sponsor of the Special Olympics. Whitehorse Toyota’s commitment to the Yukon is also evident in the design of its new facility, which more than doubles the dealership’s space to 25,000 square feet. A new 2,700 square foot showroom has room for six vehicles indoors, with TV and internet facilities in the lounge. Visitors can explore a new tech centre, which highlights Toyota’s industry leading safety systems and user-friendly features. The new dealership also has more space to allow for a larger on-site selection of new Toyota vehicles, and Toyota Certified Pre-Owned Vehicles. Toyota dealerships have a reputation for excellent customer service, and Whitehorse Toyota and its team of 20 employees continues to demonstrate why this is so. The dealership features an enclosed drive-through reception area for vehicle servicing, plus an indoor area to deliver new vehicles to customers – offering Yukon drivers a new level of year-round comfort. Whitehorse Toyota’s four service reception bays, nine mechanical bays, two wash bays, and two detail bays are ready to care for Toyota drivers and quickly get them on their way. Whitehorse Toyota’s new facility also incorporates a number of features to minimize its environmental footprint – notably, specially modified window glazing to provide superior insulation, to reduce heating costs and emissions, and to improve year-round comfort. 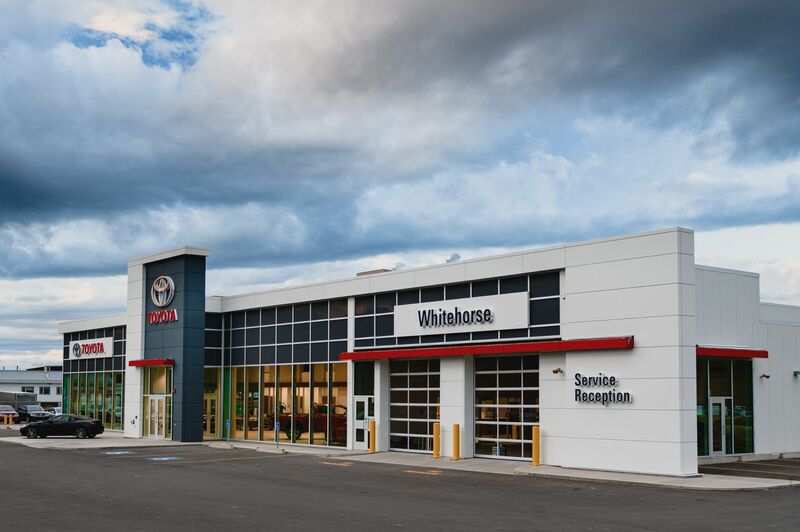 The new Whitehorse Toyota showroom and service centre is located at 111 Range Road, and is less than a 10-minute drive from its previous location. For more on the dealership, visit www.whitehorsetoyota.com. Toyota Canada Inc. (TCI) is the exclusive Canadian distributor of Toyota and Lexus vehicles. Toyota has sold over 5 million vehicles in Canada through a national network of 287 Toyota and Lexus dealerships. Toyota is dedicated to bringing safety, quality, dependability and reliability in the vehicles Canadians drive and the service they receive. TCI’s head office is located in Toronto, with regional offices in Vancouver, Calgary, Montreal and Halifax and parts distribution centres in Toronto and Vancouver. Toyota operates two manufacturing facilities in Canada. Having produced more than eight million vehicles, popular Canadian models built at these facilities include Toyota RAV4, Toyota Corolla, Lexus RX 350 and RX 450h hybrid.